MASKerade: RIC53 - Glory to the Newborn King! RIC53 - Glory to the Newborn King! 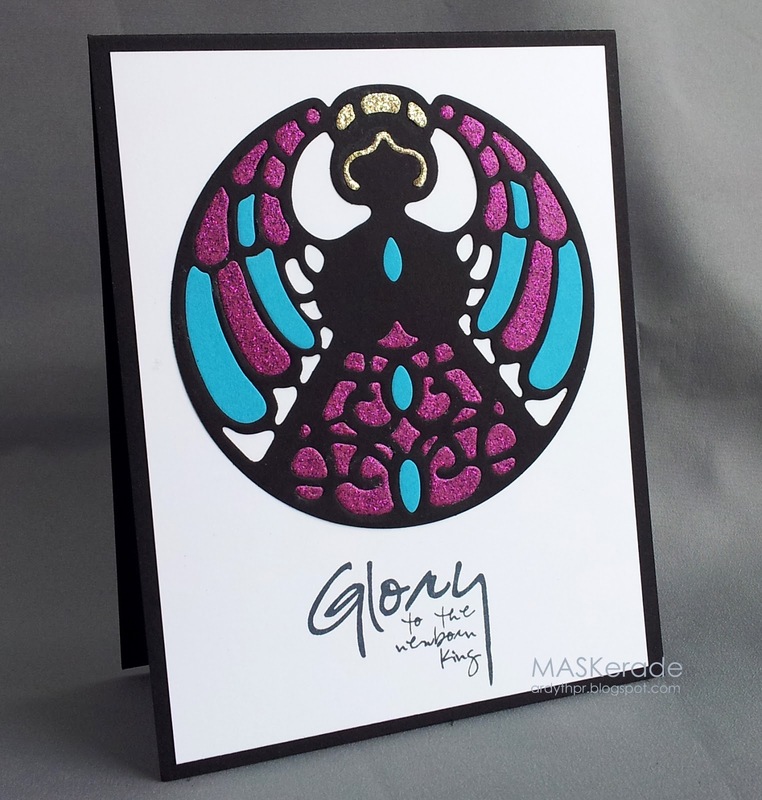 This week's Runway Inspired Challenge was perfectly timed - it arrived on the same day as this beautiful stained glass angel die from Die-Versions. I focused on the 'medallion' right in the centre above the waistline of the dress - it has some beautiful turquoise as well as the magenta and gold. Inlaying all those little pieces was a little fussy, so I don't think this will end up being mass-produced as a Church Christmas card! I'll have to find a simpler way to use this beautiful die again! ETA (February 18): This card was a winner! Oh la la...stunning Ardyth! Don't you love that Verve sentiment?! Wow, stunning Ardyth! Looks like rich stained glass. That stained glass angel die is spot on !! Wow that medallion is perfect for the inspiration ! Beautifully done! A gorgeous card well worth the effort of the fussy inlay work. In thinking of a simpler way to mass produce something similar I think if you coloured vellum and place the outline on top it would work. The colours might not be as rich as the ones you chose here, but it could give a light and airy feel to the card. Ooooh! Love that die and how you pieced the pieces back in. Stunning! Love your bold colors and the stained glass die. This is so beautiful. It's inspiring. Absolutely stunning, and such an original take on the challenge. AWESOME use of stamp and colors! I love love your take on this, Ardyth!So glad that you join the fun with us at Runway Inspired Challenge! HUGS! Absolutely stunning! Fitting all those little coloured pieces back in might have been time-consuming, but the result is so worth it! 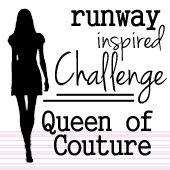 Thanks for joining in with us at Runway Inspired Challenge! Congratulations on your win, well deserved. Congrats on your well deserved win at RIC! Your card is really gorgeous! Congratulations on your win, Ardyth! What a stunning effect... totally worth it the time you spent inlaying all the pieces!